Here are three things you can do on Sunday, May 7: raise funds to help out federal employees in need, show support generally for public servants, and get some exercise. And you can do them all simultaneously at the Federal Employee Education and Assistance Fund’s annual 5K Run/Walk. FEEA is a nonprofit organization devoted to helping federal employees in need through loans, scholarships and grants. Since its founding in 1986, the organization has assisted more than 50,000 employees and family members. It is perhaps best known for its work with the children of victims of the 1995 bombing of the Alfred P. Murrah Federal Building in Oklahoma City. 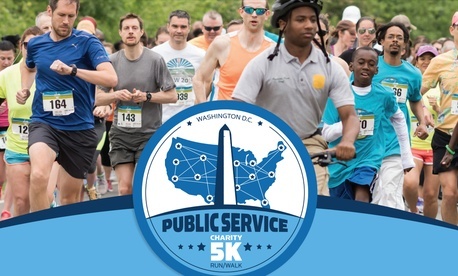 The May run/walk will take place in connection with Public Service Recognition Week. In Washington, the event will be held Anacostia Park. But FEAA is encouraging people around the country to form local teams and run or walk in their own communities. Proceeds from registration for the event go to support FEEA’s work in providing emergency loans, disaster relief grants and scholarships to federal employees and their families. Participants can also raise money for the fund by soliciting pledges from their friends and family members.